Welcome to the brand-new Ideal Marketplace in Clifton, NJ! This former Pathmark closed in A&P's bankruptcy with no buyer. Ideal reopened here on Wednesday, May 3, 2017, about a year and a half after Pathmark closed. Ideal only took about 30,000 square feet of the Pathmark, with a gym expected to open in the other half soon. Pathmark opened in the mid-1990s as a replacement store for what later became the A&P, then Price Rite of Garfield on Outwater Ln. Although the store looks very large from the outside, it actually only goes about to where the black light post is. The rest is vacant and under construction. This pretty beat-up sign was spotted in the parking lot. It's one of the few Pathmark items left behind. We'll see just a few more! Another are the cart corrals, although they have been painted green, and the sign in the center has been replaced. We saw similar treatments at Superfresh Food World in Belleville and Food Bazaar in Elizabeth. Heading inside, we're greeted by a large produce department with a floral service counter to the left. Behind the floral department is a small seating area. The produce was really fantastic here. Not only was the selection great, but the prices were really good and it was all very fresh. There's also a larger organic selection in produce than I expected. 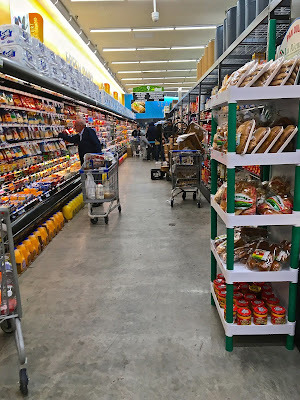 Continuing toward the back of the store, we encounter the hot food area, salad bar, bakery/juice/coffee, and deli along the right side wall. In the back there is a fresh tortilla maker! You can get fresh-made, hot tortillas right in the bakery department, something I've never seen before. Sorry for the bad picture. We're looking back toward the front of the store here. Looking toward the back of the store, with the tortilleria on the right. Baked goods cases in the back of the store. Getting closer to the tortilla maker, with deli and bakery to the right. 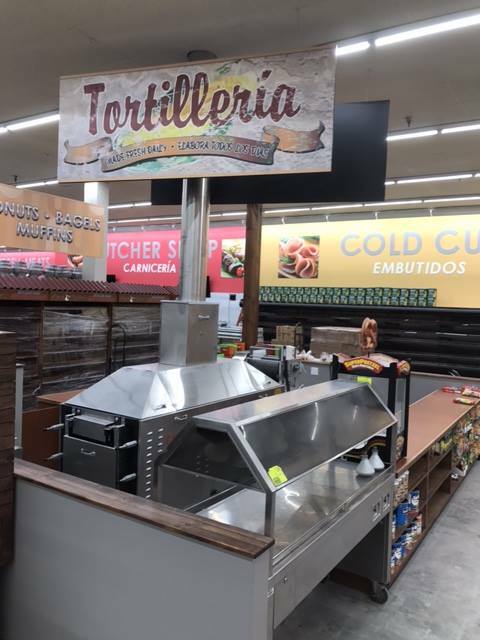 A photo of the Tortilleria from Ideal's Facebook page. Tortillas here are sold by the pound, and they were on sale for $0.95/lb this week, when I visited. So I ordered one pound. However, at the register, our cashier entered the weight wrong, as 0.01 pounds. So we ended up paying $0.01 for a pound of tortillas. Not bad! Meat and seafood are along the back wall, with a large service meat counter to the right here. Past the service counter there's a small indentation with packaged meat, then seafood in the far back corner. The rack that the tortillas are on here is left from Pathmark. The grocery aisles are fairly standard. The shelving is all new and very nice. The freezer aisle, second to last, has all-new freezer cases. The last aisle is dairy and bread. Along the front end, there is a pharmacy that is not yet open. It is currently being stocked, and I think they're waiting on a permit from the city. The customer service counter is next to the pharmacy. Every register was open (there are only seven). This store was actually pretty crowded, with people buying large grocery orders, which is a good sign. The seating area is past the checkouts next to the exit. It's very pleasant (I ate lunch here - the food was very good!). Some online reviewers complain about the lack of English-speaking employees, but all seven employees and managers I encountered spoke English pretty well. It has a good balance of Latin, eastern and southern European, and American foods, which represents the population around. You can get fresh tortillas AND Polish rye bread from a bakery in Wallington. You can also get fresh bread from Calandra's Italian Bakery. Definitely stop in and check out Ideal Marketplace if you're in the area. It has a great balance of ethnic and American foods, and a substantial organic/natural selection. The produce is great, and don't forget the tortillas! They did a great job of renovating part of the former Pathmark. It's also smart that they didn't take the whole thing, because they might have been way overwhelmed in that huge space like Key Food Port Chester or Fresh Imperium. Highly recommended!